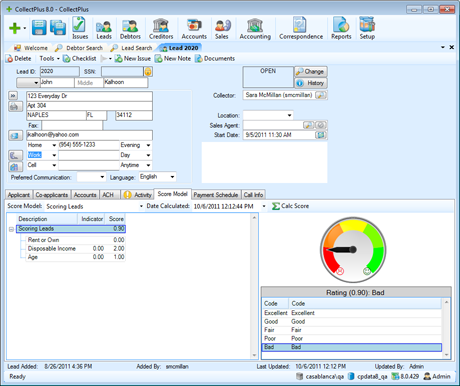 Quickly evaluate the chances of getting paid using the Debtor Scoring functionality in CollectPlus. Or calculate the risk before originating a loan or issuing additional credit to a debtor. The Scoring feature in CollectPlus allows you to define your scoring model based on data from the database or additional input questions. Each answer can have a specific value and weight which affects the final score. For example, the employment status can be one of the variables in the model. In that case, the option "Unemployed" could have a value of 0 whereas "Employed" a value of 1. If the debtor is unemployed, the score is lower than if he is employed. You can then add another variable to the model for homeowner status "Own" vs "Rent", and so forth, until you have as complex a model as you want. This is a simplified view of our Scoring Model feature. In CollectPlus you can define complex questionnaires with mathematical formulas attached to answers. CollectPlus allows you to have multiple score models that you can run on the same debtor to evaluate the risk of non-payment. You can define your collection strategies based on those scores to maximize your revenue. The Scoring feature lets you quickly valuate an entire debt portfolio, which is critical for debt buyers wanting to reduce the risk of their purchases, and maximize the return on investment of their debt portfolio sales. You can quickly see the maximum, minimum, and average score for a portfolio or a subset of a portfolio in CollectPlus.